Who doesn’t love the crunchy goodness of Taquitos? They’re almost the perfect finger food, designed exclusively for dipping in homemade guac, salsa, or even sour cream. But…….they’re usually deep-fried – meaning way too many calories and way too much fat. So I thought – why not bake them? And although these did not turn out exactly as I had hoped – let me tell you they were still extremely yummy. The filling is the easy part in this recipe. I basically softened up a chopped leek, about half a red bell pepper, a 4oz can of green chiles, and some garlic, and then added a can of refried beans and a can of black beans. I then spiced it up with a little chile powder, chipotle, and cumin and then mashed everything into a paste with a potato smasher. And finally I added about 2 cups of frozen hash browns to thicken it up. 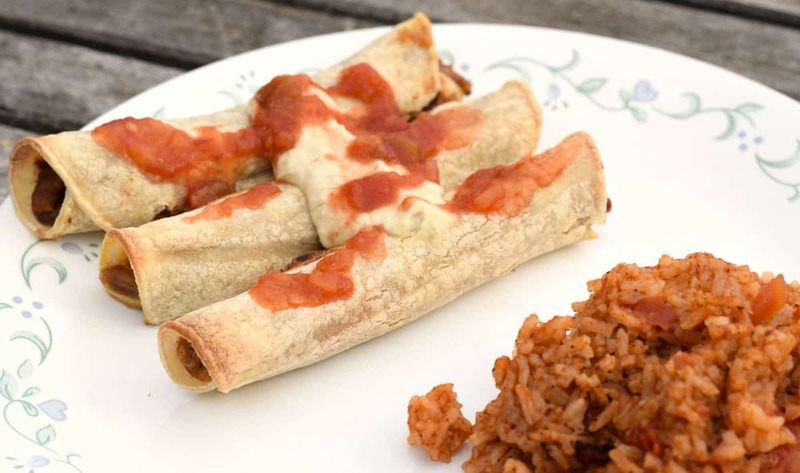 I also had a batch of my Amazing Vegan Cheese Sauce on standby, just for these taquitos. Now you won’t use the whole batch, which means you’ll have plenty of cheesy goodness for other recipes this week. As they are – they’re not exactly made to fold, roll, or basically do anything to except leave flat. Otherwise they crack, break, or tear. I microwaved my corn tortillas to soften them up – but without something (usually oil) they will sit there on the plate and literally split right down the middle while you watch. Now I don’t know if there’s a better way or not – but what I ended up doing was liberally wetting down each side of the corn tortilla with water before adding my filling and rolling. This seemed to really help them keep their shape, even during the baking, so give it a try. Here is a pic without using the water rub and you can see it starting to crack already….. I used a rubber spatula to smear a thin layer of cheese sauce, and another rubber spatula to smear another thin layer of beans on top of that. You can also see in the pic to not put your bean filling all the way up to the top of the tortilla – it will just squeeze out the top when you roll it. Leave the top inch or two free and use the cheese sauce to seal it up. This recipe made enough for me to completely use a 30 count package of corn tortillas and still have some beans left over. Make sure to line your cookie sheet with parchment paper and bake these babies for about 30 minutes at 350 degrees or until crunchy. Dip with your favorite salsa, guacamole, or my favorite – my Green Chile Sour Cream. Like I said – they’re not exactly food magazine pretty – but they sure tasted good! 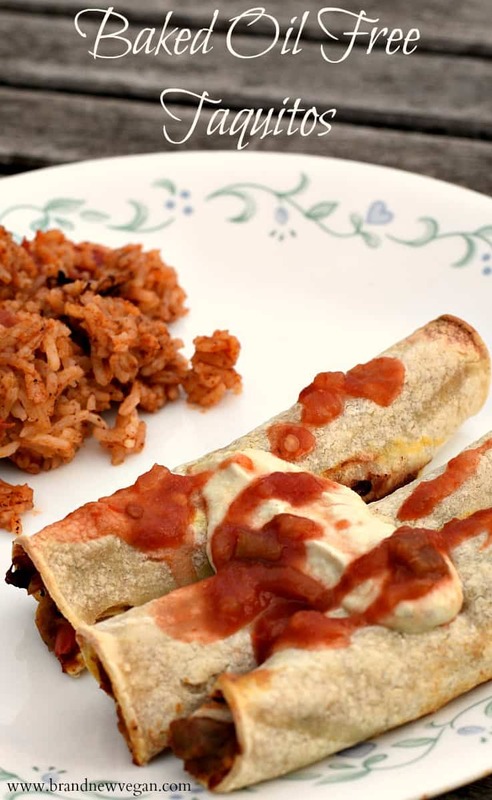 A healthier version of our favorite finger food - Oil Free Baked Taquitos. Perfect for dipping in homemade guacamole, salsa, or my favorite - Green Chile Sour Cream. Soften leek, garlic, chile, and bell pepper in a medium saucepan using a tablespoon of water. Chuck, did you drain and rinse your can of black beans? Yes definitely. It would be too soupy and salty otherwise. what temp did you put the oven at? 350F? I can’t seem to find it anywhere. I’m going to try these this week. Thank you! Did you use frozen hash browns or should I just shred some potatoes to make my own raw hash browns? I made these tonight and they split and the inside fell out but the taste made up for it they were fabulous, . Chuck, thank you for doing all the hard work on your recipes and sharing them with us.